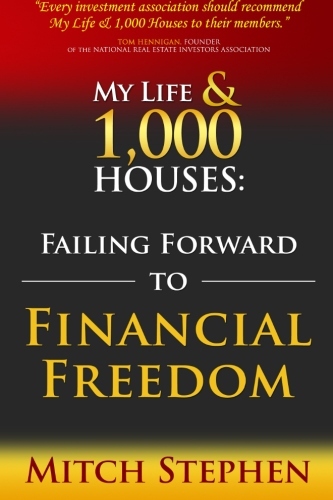 My first book, My Life & 1,000 Houses: Failing Forward to Financial Freedom, is an exhilarating book of an amateur entrepreneur who stumbles upon the long standing revelations of business, money, love and life while struggling to find financial freedom. The journey eventually culminates into the purchase and sale of over 1, 000 properties. But make no mistake, this book is about falling down and getting back up. As thought provoking as it is entertaining, this memoir and motivational story of self-empowerment will touch the gamut of your emotions; laugh and cry, but more importantly, be inspired. 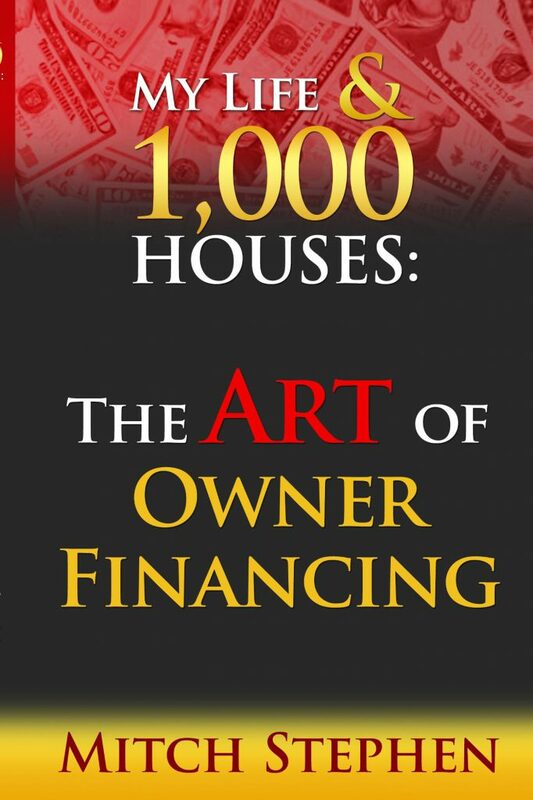 If you’re looking for real estate investing books with a personal touch, this one is for you. Mitch Stephen shares his unique journey into the real estate investment business and shows how the challenges can be conquered, one flipped house at a time. Try before you buy! 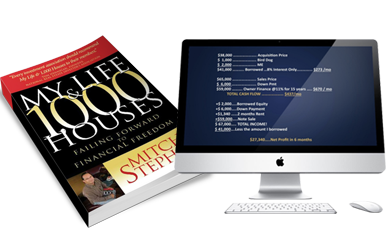 Download the first 100 pages of My Life & 1,000 Houses: Failing Forward to Financial Freedom by Mitch Stephen. This special bundle includes instant digital access to a 45 minute training video and a signed paperback copy of My Life & 1,000 Houses: Failing Forward to Financial Freedom. 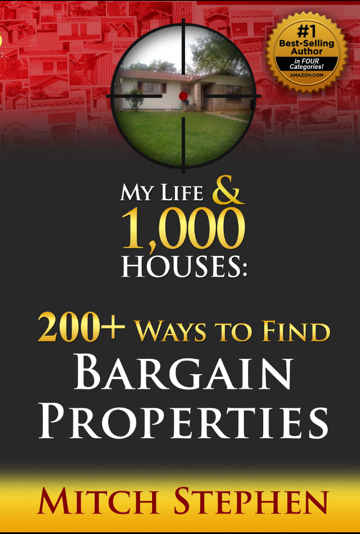 In the pages of my second in the series, My Life & 1,000 Houses: 200+ Ways to Find Bargain Properties, I give examples of how I’ve found bargain properties and a step by step guide to setting up your business brand. Some of these topics will be mundane in their explanation, but they are all effective when applied with thought and conviction. To make the book less mundane I have elected to intersperse stories from my real life experiences. If you are a meat and potatoes kind of person and just want the facts, you may be tempted to skip the stories. Be careful, more often than not, there is a nugget or two in these stories and there is always a mindset forming theme. Every way depicted in this book can result in the consummation of a great deal, but there is no one way to get all the deals an aggressive investor wants. There are inexpensive ways to cultivate leads and there are very expensive ways to create leads. I’ve come to know that most investors start out on a shoestring budget. I made a major mistake when I first began mining for deals. I didn’t do some basic things that would have made branding my name a much faster process. If you get some things right from the start, you’ll have everything pulling in the right direction from the beginning. FitSmallBusiness is the leading digital resource for small businesses, providing the information they need to succeed. How to get paid to build your cash flow. How to generate cash flow without being a landlord. How to get paid six ways on your deals. How to recognize what properties are good to owner finance. How to make money on the properties that aren’t good to owner finance. How to find private money for your deals. How to sell notes with little to no discount. Tired of being a landlord? Are you tired of all the late night phone calls about leaking toilets, busted hot water heaters, broken air conditioners, and on and on and on? If so, this book is a must read! For years the gurus of the day have been selling us the “Buy & Hold” myth. Most landlords have fooled themselves into thinking they’re making money. Year after year would-be-retirees have to postpone their retirement because the rental income they calculated on paper never makes it to their tax return. Mitch can show you exactly why this is happening and how to stop it from happening by using a strategy that is less known and grossly misunderstood. The owner financing strategy changes everything! Change your property’s value. Change your community for the better. Change your buyer’s life, and change your personal financial situation in the process. All kinds of doors open when we stop using broken down traditional techniques and start thinking outside the box. And best of all, 90% of the deals are done with none of your own money! The strategies in this book are mind-blowing!